Why Aren't Human Fingers All the Same Length? 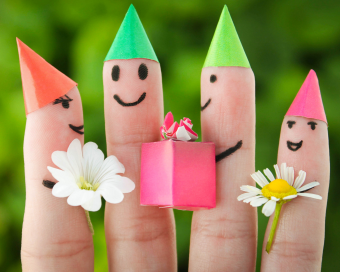 Tumarux asks: Why aren’t our fingers all the same length? The human hand is remarkably different from that of other primates, with shorter fingers, a smaller palm and a significantly stronger thumb; of course, the most notable feature of our hands is the ability of the thumb to perfectly and comfortably oppose (come into square contact at the tips) each finger of the same hand. While we can’t know with 100% certainty all the factors that led to the evolution of our hands, it would seem it all revolves around this perfect opposability, and the various advantages that provides in certain scenarios, that has dictated the length of each finger. It’s not entirely clear when the modern human hand appeared. Prior to a recent discovery, the consensus was about 800,000 years ago. However, after finding a third metacarpal with a styloid (lump at the base) dating back to 1.4 million years ago, scientists are now wondering if the modern hand evolved even earlier. The hands of our ancestors millions of years ago were much like those of modern chimpanzees, whose hands, palms and fingers are much longer, and thumbs are much smaller and weaker. Evolved to accommodate knuckle walking and climbing through trees, their fingers are curved, and the tips lack the broad bones (apical tufts) to support the highly sensitive, wide fatty pads of human fingertips. Altogether, this produces a hand that works very well for hooking onto horizontal supports (e.g., tree branches) but can easily lose its grip when waiving a stick and has little strength or precision when attempting to squeeze or pinch. Compared to this poor-gripping, relatively awkward paw, our hands have much shorter palms and fingers. Our fingertips have strong supportive bones on top of which are broad, sensitive, fatty pads that will accommodate uneven surfaces. The palm also has added fatty pads, some of which provide further protection for the hand, and also aids in gripping. The bases of the thumb, second and third fingers have all been strengthened to withstand greater stress, and in fact, the thumb has three muscles attached not seen in chimpanzees: the flexor pollicis longus, flexor pollicis brevis and first volar interosseous. Together, these make for a significantly stronger thumb that, along with some modifications to certain joints, allows for full, comfortable opposability. Researchers have focused on several theories to explain why these changes occurred, and one of the most popular is that a better, stronger, finer grip was needed for making better tools and thus those who had such a grip had a distinct advantage in this way and others were selected out. Using stone tools dates back to about 3.4 million years ago, and around 1.7 million years ago, more refined (but still crude) tools, like axes and cleavers, had appeared. Over the next million or so years, tools became progressively more refined, while the hand evolved to its modern state; since hand strength and dexterity are required to make and use better tools, it is thought that the advantages the latter provide led to the evolution of the former. Another similar theory holds that our hands evolved thanks to the advantages this provides in accurately throwing and clubbing things. In support of this hypothesis, scientists point to the fact that there are two main prehensile (gripping) actions of a human hand: one that grasps with precision and one that holds with power. The precision grip is perhaps best illustrated as the way a pitcher holds a baseball, while the power grip can be seen in the way a man holds an axe. According to adherents of this theory, without the evolved, long and opposable thumb, and precise control of fingertips, a primate couldn’t throw with much strength or accuracy. Likewise, without the vice formed by the thumb overlapping the fingers, and its new powerful flexor pollicis longus muscle and the additional fat on the palms, an axe would easily slip from the hands of a primate (as is sometimes seen with chimpanzees wielding sticks). A third, equally violent theory acknowledges both of the first as potentially contributing factors, but notes that neither explains precisely why the hand holds its present, relatively stocky shape. Claiming however, to have the key to the “geometry” of our hands, adherents of this theory note that the human hand only becomes a truly strong weapon when it is formed into a fist. They also identify several facts in support: (1) chimpanzees cannot form a good fist; (2) the smaller surface area of a fist delivers a blow with greater force; and (3) the way the bones are arranged when one makes a fist imparts even more force on the victim. And it is the precision with which the bones are aligned that the researchers feel most bolsters their argument. When clenched in a fist, there is no space inside, and this is because of the precise lengths of the finger bones; in addition, the excellent support provided by the thumb is due to the fact that it is precisely the right length, and begins at just the right place on the palm. Why are our fingers different lengths? I say, “…the human hand ‘appeared’…” just about the time God CREATED IT, on the end of Adam’s arms! Gosh! Of COURSE!!!! How could we have missed that? While we were kept busy examining fossils, and other positively dated artefacts, the real truth was there all along. However that does not explain how it is that all these real discoveries note that there has been notable changes through the ages, not only to humans, but to almost everything that is alive, or even inert such as rocks and bodies of water and so on. So what, exactly did god create? what we see now? What existed 2,000 years ago? – or what existed back in the time of our real creation some 800,000 years ago? Apparently in a vacuum. Maybe we should ask Him? It’s amazing how people just can’t think outside of the box, so they think there is no god. If you lived on Venus your day would be over 116 of our days. Is it so hard to believe that God might have a longer day. Maybe he works with evolution to build things. Why do people always look at things around them as proof that God does not exist. Maybe our understanding of things is limited. If I told you I live on a flat piece of land, would you say that I’m a fictional person because the world is not flat. Maybe your limited thinking is limited your understanding of things. Science and God can co-exist.